These ABC worksheets are the best. They give kids a chance to think about and focus one one letter at a time. 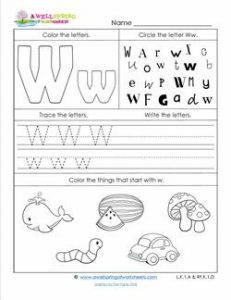 In this letter w worksheet, kids get a chance to recognize and identify the letter in many different forms – bubble letters, skinny letters, fat letters, sideways letters, and straight up and down letters. Kids get to practice writing the letter w, too. Last but not least, kids can look at the objects, sound out their names and color the ones that start with w.